Research indicates 96 percent of homes have at least one type of indoor air quality issue. An indoor air quality (IAQ) monitor will report on the levels of common pollutants and other air conditions inside your home in real time. The culprit could be anything from excessive dust to high humidity to emissions from household cleaners or building materials. The problem is, most people don’t know there’s a problem, and if they do figure it out—usually tipped off by allergy-like symptoms or more dramatic health effects—they don’t know precisely which pollutant is causing it. Some indoor air quality monitors will also track outdoor air quality to provide context for your indoor readings. The measurements are then displayed on a screen on the device itself as well as in a companion app on your mobile device. Most IAQ monitors will alert you to unsafe levels via an indicator light and/or push notifications to your smartphone or tablet. Once you’re aware something has risen to hazardous a level, you can take action to reduce it—usually by opening some windows. Some monitors will even trigger other smart appliances—such as an air purifier, a fan, or a dehumidifier—to help improve the air quality. Ultimately, a good IAQ monitor should provide enough clues for you to investigate and eliminate the source of your air quality woes. 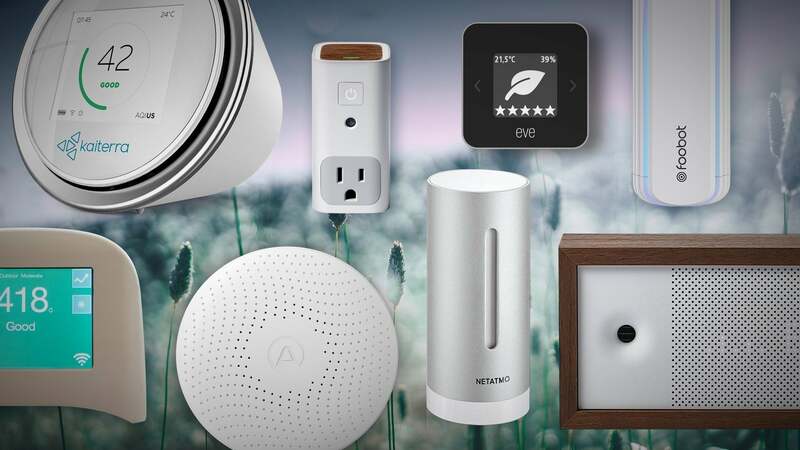 Here are our current top picks for indoor air quality monitors. We’ve also included a guide to the pollutants a good IAQ monitor should track. And if you scroll down to the bottom of the page, you’ll find links to all of our latest IAQ monitor reviews. 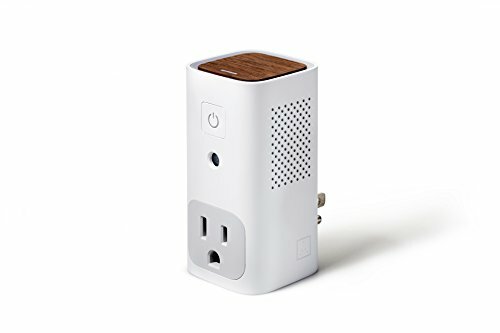 This unobtrusive IAQ monitor plugs directly into an AC outlet and tracks temperature, humidity, CO2, and chemical pollutants. These levels are displayed in an easy-to-read app dashboard and are aggregated into an overall air quality score of Poor, Fair, or Good. You can select from five monitoring profiles, ranging from general comfort to monitoring optimized for allergy sufferers or newborn babies. Best of all, you can plug in a “dumb” appliance—such as a fan or a dehumidifier—and the Awair Glow will automatically activate it based on a schedule, when pollutant levels rise, or when someone enters the room. Radon is one of the most common and deadly indoor pollutants, and it can’t be detected unless you’re actively looking for it. The Airthings Wave Plus is currently the only monitor that tracks Radon in real time. While that alone makes it worth the investment, it also tracks levels of carbon dioxide and VOCs (volatile organic compounds). 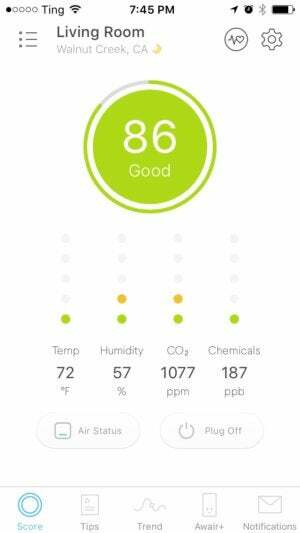 You can get a quick air quality status by waving your hand in front the unit—hence the name—or dig deeper into current and historical measurements on the easy-to-use mobile app. The Airthings Wave can also be paired with IFTTT applets to alert you to high radon levels by text message or by changing the color of your Philips Hue smart bulbs. If our top picks don’t match your needs, this guide will help you understand the most common air pollutants, so you can find one that does. Most IAQ monitors currently available can’t monitor for all of these, so choose the ones that matter most to you. PM2.5: Particulate matter, or PM, is a mix of particles and droplets in the air. PM varies in shape and size, but those of 10 micrometers in diameter or smaller can adversely affect your health because they can be inhaled. PM 2.5 refers to fine particulate matter—that with a diameter of two-and-one-half microns or less. Sufficient exposure to PM2.5 can irritate the eyes, nose, throat, and lungs, leading to allergy-like symptoms and shortness of breath in otherwise healthy people. It can also exacerbate existing medical problems, such as asthma and heart disease. The World Health Organization considers PM2.5 the world’s single biggest environmental health risk. Indoor PM2.5 levels can be influenced by outdoor sources like vehicle exhaust, wildfires, and power plant emissions. But many indoor activities produce PM2.5 as well: Cooking, burning fireplaces, and smoking are just a few common sources. VOCs: The acronym stands for volatile organic compounds, gases emitted from a variety of materials that can have short- and long-term health effects. According to the Environmental Protection Agency, concentrations of many VOCs can be up to 10 times higher indoors than outdoors. Sources of VOCs include many common household products, including hairspray, cosmetics, cleaning fluids, disinfectants, paints, and varnishes. Burning fuels like wood and natural gas also produces VOCs. Formaldehyde is onne of the most common VOCs and can be found in many building materials, including plywood, glues, and insulation. Formaldehyde is also used in some drapes and furniture fabrics. You can read more about formaldehyde and its sources in this article from the U.S. Consumer Product Safety Commission. Short-term exposure to the low levels of VOCs can cause throat irritation, nausea, fatigue, and other minor complaints. Long-term exposure to high concentrations of VOCs has been linked to more severe respiratory irritation as well as liver and kidney damage. Products can emit VOCs even when they’re in storage, though to a lesser extent than when they’re actively being used. Carbon monoxide: By now, most people are aware of the deadly effects of high concentrations of this odorless, colorless gas. But exposure to lower levels sometimes given off by fuel-burning appliances can also cause adverse reactions, including confusion and memory loss. A few air quality monitors claim they can detect these lower levels. The only reliable way to be alerted to this notoriously hard to identify killer, however, is with a standard carbon monoxide detector. The Airthings Wave can report on the CO2 levels in your home as well as any detectable radon. Radon: Radon is a naturally occurring colorless, odorless gas that is the leading cause of lung cancer in the United States after smoking, according to the EPA. As it’s a byproduct of the naturally occurring breakdown of uranium in soil, rocks, and water, it’s ubiquitous both indoors and out. Typically, indoor radon levels must be checked using charcoal-based kits and require you to test your levels for up to 90 days. You then need to ship the kit to a lab for analysis and wait for the results. An indoor air quality monitor with a radon sensor can provide faster results by monitoring levels in real time. Currently, the Airthings Wave is the only monitor in our guide with this capability. Carbon Dioxide: While the effects of high levels of CO2 were long thought to be benign, research has found that concentrations as low as 1,000 ppm can affect people’s cognitive function and decision-making performance. The greatest source of indoor CO2 is people themselves, as it’s a byproduct of our respiratory function. Coupled with poor ventilation, this commonly leads to high levels of CO2 in many homes. Fortunately, CO2 sensors can be found on most air quality monitors. Temperature and Humidity: These levels can affect more than your comfort. High temps and excessive humidity promote mold and mildew growth. These can cause structural damage to your home and cause allergy-like symptoms in those with sensitivities. Monitoring these levels can help you prevent home and health problems and tip you off to potential sources like foundation cracks or leaks and poor insulation. 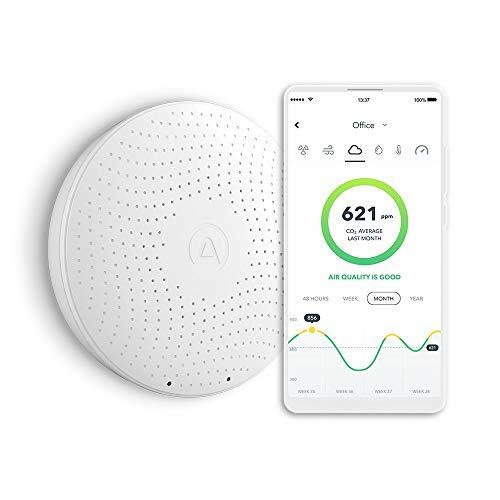 The Laser Egg 2+ makes it easy to understand when particulates and chemical compounds are polluting your home's air, so you can take corrective action. 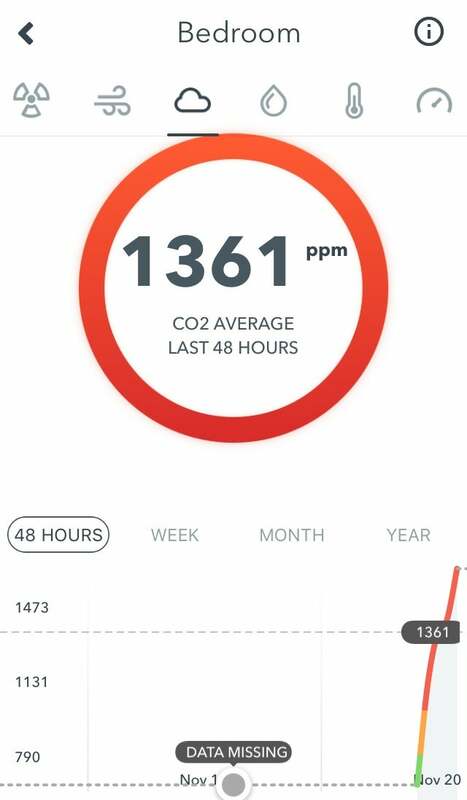 The Speck air quality monitor tracks the level of particulates in your home’s air, but it won’t actively warn you if they reach levels that can harm your health. The Eve Room is a useful accessory for monitoring indoor air quality as part of a HomeKit ecosystem.